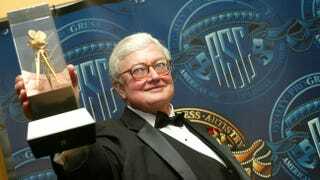 Let's Shut Up About Ebert, Once and for All. It is unwise for us to seek the validation of people who were, and let's be honest here, never going to give it to us in the first place. This is the last article I hope I ever see in the gaming blogosphere regarding the late Roger Ebert, a high-profile film critic (as if you haven't heard of him) that stirred up quite a storm a few years back when he claimed that video games weren't art and never could be for, to be fair, dubious reasons. We tried to convince him otherwise, but he rejected everything we showed him outright, which really speaks to me. It says "Yeah, he doesn't care. Now that we've figured that out, Now that we've learned everything we needed to learn from him, can we forget about this whole ugly mess and get back to work?" Now don't get me wrong. There's merit in the criticism that we get from outside. We should be asking ourselves why people in general say all the things they do about video games, why they're so quickly linked to killers, why they're treated like a disease on the level of polio and the West Nile virus. And maybe, obviously, that's our fault. But what we should be doing is making sure that the next generation embraces our medium, not forcing it on a generation that has had plenty of time to make up its mind. It's exhausting and worthless to try and dissect particular instances of this treatment. It's not that we should ignore our critics or become complacent or anything, it's just that we spend so much time trying to lock horns with people who aren't going to budge no matter what. At some point, arguing becomes counterproductive. When Ebert first denounced video games, a lot of us wanted to show him how wrong he was. I was there. I know. Heck, I did at first, and it was the biggest catalyst for me to seriously start learning about game design. I hoped that maybe, some time later when I had more money and a few friends, I could make a game that was so indisputably Art that not even Roger Ebert could deny it. But that was never going to happen. He would have hated my game, regardless, because he was being bull-headed and he said so himself. People do that. We've adopted this myth that the right video games have this magical power to win over anyone who plays them, even if they had been rejecting games for their whole lives, if they'd wished they would just go away. But that's not how people are. People are stubborn. People stick to their guns. People vote for one political party and denounce the other party unconditionally and without exception and do not change their minds for the rest of their lives. Not everyone does this, I'll admit, but not a lot of people don't, that's for sure. That goes double for emotionally charged topics, and anything that's caused this much controversy and that matters to so many people is going to be an emotionally charged topic. ...or, as it will forever be known to the contemporary public: Schlock. But we have a whole generation of people who haven't made up their minds yet. They're our future; shouldn't we be focused on making something that, when the time comes for them to make their judgement, they won't dismiss as the toys of an overindulgent era? Besides, if we are going to act on criticism, why is his criticism so important? Because he knows a lot? About movies? Is this really his call? Should it be? We have critics on the inside too, you know, people who can understand and even appreciate the way a game works, and still aren't satisfied. People like Leigh Alexander, Ian Bogost, Anna Anthropy, Mattie Brice, Jonathan Blow and Hell yes Anita Sarkeesian. Their criticism is informed, and therefore it should hold more weight when it comes to what we decide to do with our creative energy. Why not try to impress them? I wish Roger Ebert could have seen Gone Home, not so that he could approve it as art, but so that he could reject it, so that we might realize what's going on, learn to ignore him and get over ourselves. May he rest in peace, far and away from our incessant squabbling and vitriol. Now, all together. Let's close the book on this one. This is also on my blog. And you'll find the rest of my writing here.